“But I’m no good at meditating! I tried it once, and it just didn’t work. My mind was all over the place.” I used to think this a LOT when I tried to meditate. My mind was like a squirrel on speed. Actually, it still is. I start out with the very best of intentions and then I wonder what I should wear to church on Sunday, but does it really matter since I’ll have on a robe? I probably should do laundry, o, but are we out of detergent? Where’s my Target list? On my phone. Where’s my phone? O, right, I’m meditating. Dang it, I blew it again. Where was I? Should probably just quit. And that’s just in the first 15 seconds. What, you too? Guess what? No one, and I mean NO ONE is “good” at meditating. Not ancient desert mothers and fathers of Christian faith. Not the pope. Not Buddhists. Not yoga teachers. Not the “spiritual but not religious.” It’s just not what our brains do naturally. Remember, our brains like to keep us alive, and in order to fulfill their mission, they have mastered the art of constantly scanning our surroundings for possible threat. But in today’s world, the lines between the outer landscape and the inner landscape have blurred, so now, my brain remembers we are out of laundry detergent and thinks, “THREAT!” Okay, it might be, in a house with two teens and a runner, but probably not a dire, life-threatening threat. That’s why I find it so helpful to have something to hold onto, either literally, in my hand, or figuratively, in my head. Because my own faith tradition has got the “conversational prayer” down. “Take it to the Lord in prayer?” You betcha! We can have a conversation / monologue for as long as the Good Lord is willing. But centering? Listening? Being still? Meditating? Stop chasing rabbits in the name of prayer? Ha. Good luck with that. But try this: First, think of one word you want to describe how you want to be in this world this day. Compassionate? Joyful? Peaceful? Calm? As long as you aren’t picking something like angry or crabby, you’re good to go. Now, before you start trying to meditate on that one word, imagine yourself walking across a stream, balancing on the rocks that are just above the water. 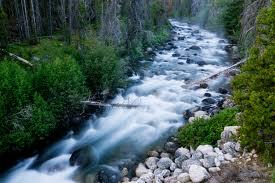 The water is trickling by; the rocks are big and flat and dry and perfectly spaced. Your path is clear: You are walking toward compassion, or joy, or whatever your intention is. Breathe in your word, breathe out your word, imagine taking a step with each word. Got it? Great! But, uh, oh – here comes the whitewater of your rushing thoughts and the water starts swirling around you and you can’t quite see the next rock and your thoughts have splash! knocked you right into the water. No problem! As soon as you realize you are wet and cold, mucking around in the river of random and probably stressful thoughts streaming by, step out of that water, back onto the rock of your word. If you can only stay on that dry rocky path for 10 seconds – Great! Do a meditation of 5 minutes in 10 second intervals – Sure, you’ll slip off in 10 seconds, but think of all the practice you are getting noticing you are in the whitewater of stressful thoughts streaming by! Wouldn’t you rather be on the calm, dry, solid rock of your word? So climb back up! Until the next time. And each time, you’ll catch yourself cold and wet and shivering faster and faster, and get better and better at climbing on the solid rock of your intention.